Scare season is back! Halloween is here once again, well almost and it is not just for witches, goblins and ghosts. As you prepare your home and family for one of the most fun American traditions there is don’t forget about preparing your business also. One thing all holidays come with is the opportunity of capitalization and Halloween is no exception to this rule. Halloween is a time to for you to use your imagination, be creative and hopefully eat lots of sweets but aside from that it is a great time for promotion. There are any number of great promotional novelties to associate with Halloween and they don’t all have to be scary. Don’t be left out during this season of mysticism, jump in with both feet and rediscover how much fun this holiday can be. When most of us think of Halloween we think of candy and costumes but not to be left out are pumpkins. Why not give a gift that keeps on giving? A Pumpkin Stress Reliever on your client’s/customer’s desk would grab the attention of all that walk into their office not just because of Halloween, but also because pumpkin’s are synonymous with fall. Whenever I see a pumpkin, no matter the time of year I relive times when I went apple picking as a child, trick or treating on Halloween night, the leaves changing colors and drinking hot cider. Just imagine a stress ball that can revive those memories and has your company logo on it. Who would have thought something so small could invoke so much? Who doesn’t remember paddle ball? Sitting on the porch as a child I would watch my mother show me how it worked. She always made it look easier than it was but I would relish in the fact that I was playing with a toy that my mother once played with as a child. Paddle ball is a game that you can tell your kids their Grandparents play with when they were small also possibly even their great Grandparents. In a day and age where electronics are all the rage, toys like paddle ball are quickly becoming extinct. Resurrect a toy of ole and promote your business this season using a Silly Monsters Paddle Ball Game. I am going to outfit my little ones with an LED Emergency Glow Whistle this Halloween. It not only glows, but there is an emergency flasher mode that would get anyone’s attention and when that doesn’t work, there is always the whistle. This promotional flashlight is thoughtful as well as forward thinking. No one wants to imagine the dangers that come with sending a child out to trick or treat without an adult but the day always comes. Why not be the company who thought of safety first? In giving this product away, your company will be seen as family and safety friendly and every consumer likes a company that thinks past profits. Ok, so Halloween would not be Halloween without a Vampire Plush or Witch Plush Toy. Although there are now books and movies such as “Twilight” and “Beautiful Creatures” that have made vampires and witches friendly, I remember a time when vampire and witch costumes were only second to ghost costumes. These costumes would strike fear in the hearts of many but now are fun and Halloween would not be Halloween without decorating your office with one. Why not give one to your customers? Your company will surely profit not only monetarily but in cool points also. There are so many different ways to participate in Halloween Fun and Garrett Specialties has promo toys to market to not only adults but to the kid too. Why not give a promotional gift this holiday season that will inspire the imagination of the kid in all of us? 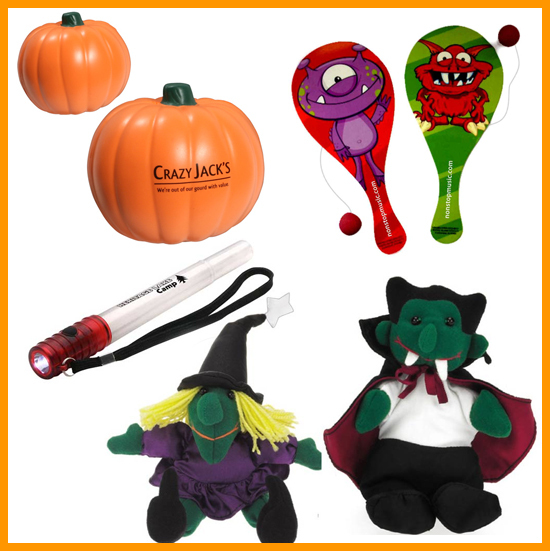 Will your company use promotional products for Halloween in the past? Will you use them this year? How have seasonal promotional products helped your business in the past if at all?